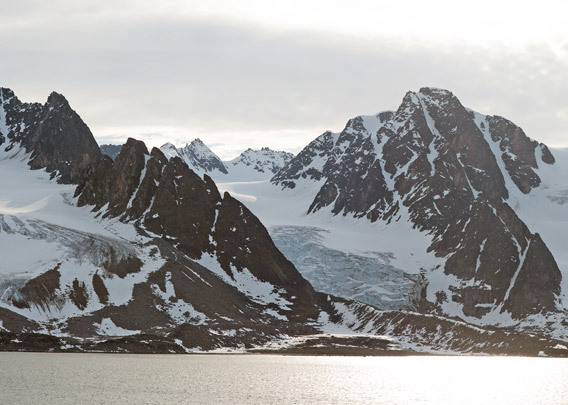 Raudfjord (“Red Bay”) is located at the western north coast of Spitsbergen and one of the most scenic fjords of the island. A number of glaciers reach down to sea level on its western side, showing nice calving cliffs between rugged, sharp mountains. The eastern side of the fjord is more gentle, with mountains being less jagged and pointed and no glaciers reaching down to sea level; a remarkable contrast in landscape and geology. This panorama shows Ayerfjord, the western of the two branches in inner Raudfjord. No 360° panorama, because of the CSS3 limitations need Flash on mobile devices to work, for example, with the Puffin browser, but due to the large amount of data, there should be problems with the Puffin browser too.